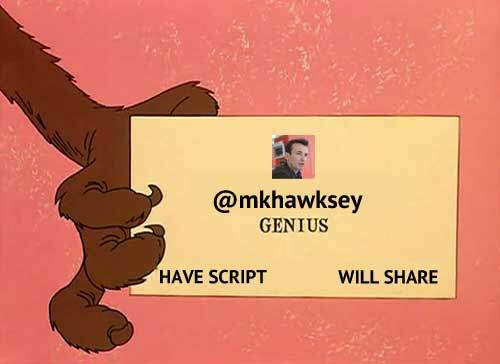 Unlike the not so wiley Coyote, Martin Hawksey’s coding genius (a) works without anvils falling or explosions and (b) is not focused on bird chasing… well maybe small blue ones. It took him like 24 hours to build this. 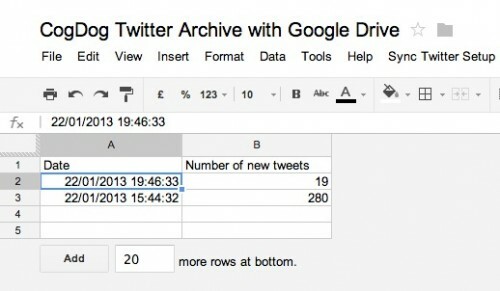 See Keep your Twitter Archive fresh on Google Drive using a bit of Google Apps Script. 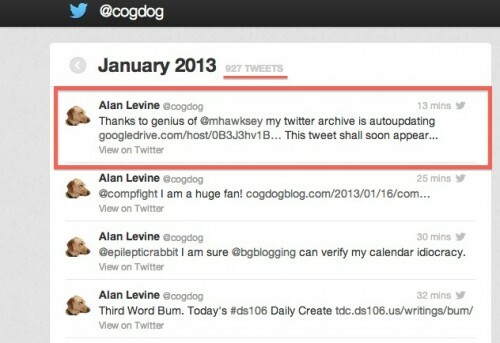 That’s right, all of thr history of the Twitter archive, but it automatically updates itself! 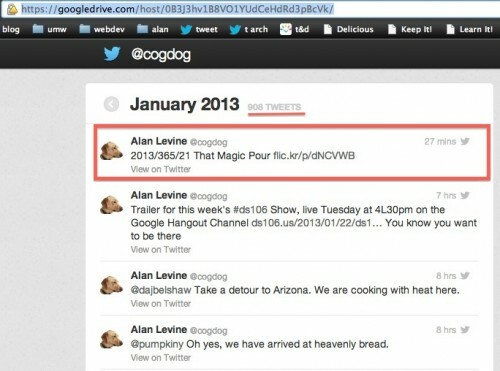 Martin not only figured out how to do that via the Twitter API, but it runs completely in a Google Spreadsheet. But wait there is nore. You can store the whole thing on a Google GDrive, so you do not even need a web host to have your own, dynamically updated twitter archive. Mine is alive and updating at https://googledrive.com/host/0B3J3hv1B8VO1YUdCeHdRd3pBcVk/ Note (August 17, 2016) Google is nuking hosting web content but Martin has an end around — using the gibberish after /host/ (a folder ID), my archive is now at https://script.google.com/macros/s/AKfycbwrXr8ejYjHwGEO6kj8f4WHIh096ARDRHdNOgAXPqGltoa80FU/exec?folder_id=0B3J3hv1B8VO1YUdCeHdRd3pBcVk (which is now what I point http://tweets.cogdogblog.com to). UPDATE: August 28, 2016: Scratch that. Martin has doubled his genius card points with his new script that now publishes the archive to GitHub Pages. A rather nice side benefit is that you can (I do) sync that locally using the GitHub desktop app or diving into command line land. I updated mine now hosted at https://cogdog.github.io/tweets and adjusted my domain forwarder to go there too. If you are one of the lucky shmucks like me with a twitter archive, give Martin’s script magic a try. The rest of ya? Keep behind the velvet ropes. And stop drooling in the red carpet. Martin, you are a generous genius. Someone call the castle and get this man knighted! If you guys were as awesome as you say you are, you’d be calling The Twitter Offices and get me the archive. Until then, you’re a bunch of twitter teases. I just called them. They said the time zone whiners were low on their priority list. Tough luck. I do not know why they are rolling it out in such a haphazard and mysterious way. Are there little bird hand packing the archives? I would be complaining too. Now stand back from the ropes, willya?